Fall officially arrived yesterday at 4:19 pm! That is no surprise to those of us that live in Northern WI. The photo below was taken on REGI property August 31. 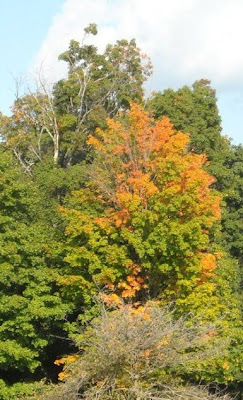 Our fall colorama in the north woods of WI began weeks ago. I do love the four seasons. There is something exciting about the seasons changing. Fall is one of my favorite times, but spring runs a close second. Years ago I would have included winter as a favorite season. The past few years of intense cold and long stretches of WAY below zero weather from November through May have cooled my enthusiasm. I truly believe my own feelings on the subject of winter would be far more optimistic if it were not for the worry about the birds in our care. I worry about them constantly when we have very cold weather, heavy snows or worse yet, ice storms. Gone are the days of being snowbound before a roaring fireplace. My snowy bound days are now more likely spent on a roof getting the snow load off so it doesn't cave in on one of our winged residents. SIGN... someday I will remember this time as my "good old days". I am finishing up the fall newsletter this week. I am in the middle of a piece on migration. Each time I delve into the subject there is new information and yet the bottom line remains the same. 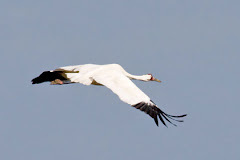 We speculate more intelligently than in years gone by why birds migrated and why they go to certain far off winter locations, we can track them now by radar and have a much better idea of where EXACTLY certain groups of species go, but it is still a remarkable undertaking for birds some of which weigh in a just a few grams. We at REGI are tuned into migration in a big way. We begin to see species that we see only when they are "passing through". Other species nest here but get in trouble in myriad ways when migration begins and they gather in flocks. Just like when we are in groups the attention to details are less in most cases and they do things like hit lines and windows in multi story buildings. It is hard to believe that not all that long ago the Canada Goose was actually "reintroduced" to our state. Quite a success story I would say. 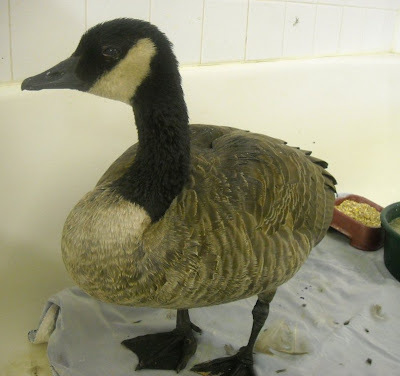 The Canada Goose in the photo came in from Stevens Point. He was apparently thinking of shopping at a local furniture store and took up a place on the sidewalk. He does have vision problems however so we can forgive him. He certainly knew where to find help. I am constanly amazed at the situations that wild birds find themselves in. 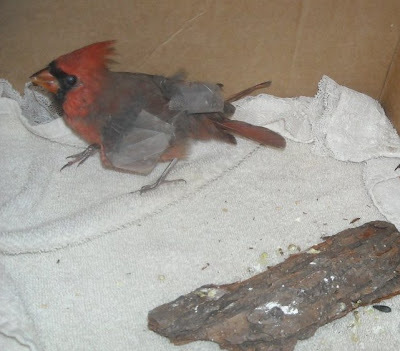 The Northern Cardinal above is a lucky bird now, but he had a real bad day a few days ago. 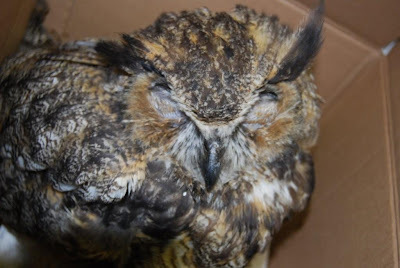 He was likely hit by a car in a residential area of Wausau, WI. The impact broke his wing. He was helpless on the ground still trying to recover from the accident when a cat ran over and grabbed him. Fortunately someone saw the situation as it occurred and called REGI. Cats kill so many songbirds. 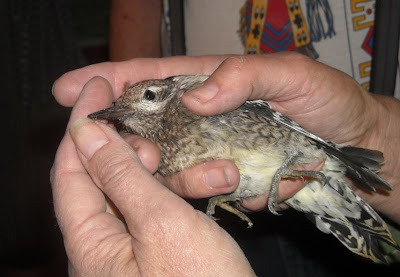 When a bird is bitten they have to be put on antibiotics quickly or a fatal infection results. 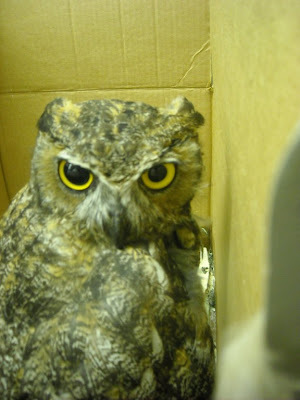 Thanks to all of our transporters that have been busy this week bringing birds from the far reaches of the state. Without you we would not be able to help so many of these amazing birds. Thank you so much. I am off for tonight. Have a great tomorrow everyone.